et omne dubium removere”, but that does not strike me as original latin. WE really need an ironclad site that can be depended on to go to when someone decides to either plagerize or mis-quote, or as I call it “hurt-quote” someone. This site might be the place – I wish to GOD it is! Chris Maher: I do my best to trace quotes accurately. Yet, this website is currently rather small. 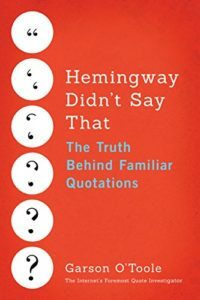 The universe of quotations is vast and this site has an in-depth analysis of 218 quotations. Take a look at the “Resources” page linked near the top of the web page for other suggestions for tracing quotes. Thanks for visiting. Garson, Thanks for the work on the silence quote. Careful attribution is difficult and with Lincoln involved its doubly so. Because of the public’s (and my personal) adoration of Lincoln it natural to presume that any pithy saying comes from him. Who dares deny it. But letting the evidence lead you and not emotional bias generally gets you to the right place, maybe Lincoln said that. Coincidentally, after reading this post yesterday, a colleague prepared a quiz of quotes this morning. The answer given for “Better to keep your mouth shut and appear stupid than to open it and remove all doubt” was Mark Twain, which if true would likely predate Switzer. It’s certainly been attributed to him in a couple of books, but I couldn’t pin down anything specific with a brief search. Anyone with better searching skills than me? I’ve always heard that this was a quote from Mark Twain; however, the Proverbs cite certainly shows that it’s been around in one form or another for quite a while. It does, indeed, sound like something that Mark Twain would have said. That’s not really grounds for attributing it to him, though. As for the candidate for attribution here, isn’t it just as likely that the book was made up of lesser-known folk rhymes that simply evaded meaningful records? I suppose we’ll never know. I learned this saying as a kid, about 50 years ago, and I distinctly remember learning it from reading MAD Magazine. My memory could be wrong about this modern usage. But I’ve known it a long time, I have a memory of the source, and I can’t think of any other source from which I learned anything that useful as a kid. I know it wasn’t in the Boy Scout Manual. Previous Previous post: Time is Money. Benjamin Franklin?